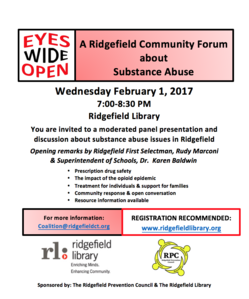 This forum is an opportunity for the Ridgefield Community to hear from a diverse panel of local people involved in this issue, including treatment professionals, law enforcement, community education professionals and a person in recovery. There will be opening remarks from the First Selectman, Rudy Marconi, and the Superintendent of Schools, Dr. Karen Baldwin. Following the panel, there will be time for questions and discussion on this important topic. There will be substance abuse prevention and treatment resource information available.